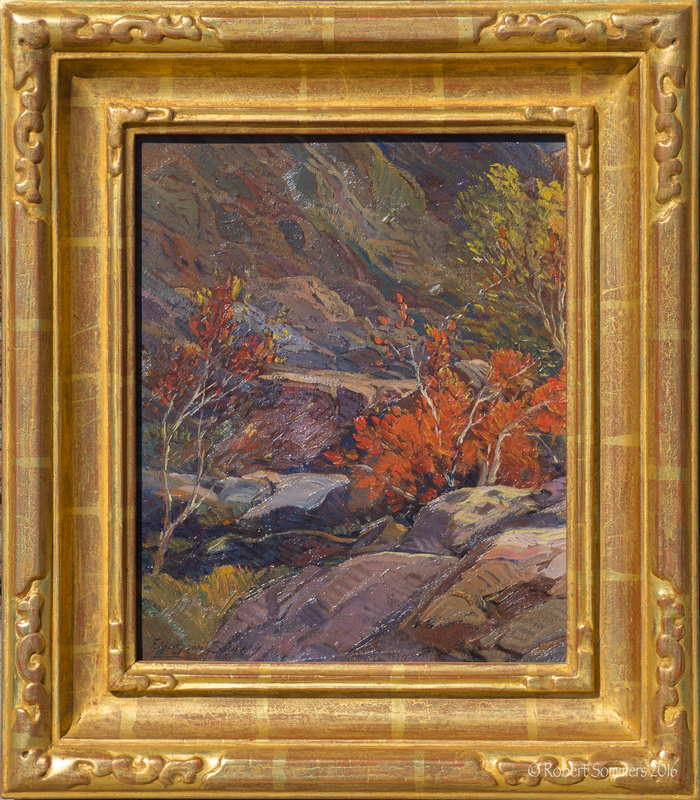 Fred Grayson Sayre (1879-1939) Tahquitz Canyon o/b signed lower left, titled verso, 12 x 10″ gilded and highly frame p.o.r. A highly successful illustrator who later became one of California’s best known desert landscape painters in both oil and watercolor, Fred Sayre was born in Medoc, Missouri. His only formal art training was several months with portraitist J. Laurie Wallace in Omaha, Nebraska. He first worked in lead and zinc mines and with leather goods and then determined to become an artist. He took an engraving job in Houston, Texas, and then moved to Chicago where he earned distinction as an illustrator and was a member of the Pallet and Chisel Club. A near fatal bout of diphtheria changed his life when doctors persuaded him to move to California. In 1916, he traveled by train through the Southwest and was enchanted by the desert landscapes. From 1919 through 1922, he lived and painted in Arizona, working also as a bookkeeper at night for a mining company. He returned to California in 1922 and settled ultimately in Glendale, thriving in the climate of the West. That same year, he held his first art exhibition in San Francisco. He was a charter member of the Painters and Sculptors Club of Los Angeles, serving as president in 1929. Exhibition venues included the Los Angeles County Museum of Art, Bohemian Club of San Francisco, Wiltshire Art Galleries in Los Angeles and Glendale Art Association in Glendale.